Blanche McCrary Boyd's first novel in twenty years continues the story of her protagonist Ellen Burns. When Tomb of the Unknown Racist opens in 1999, Ellen--now sober, haunted by her activist past, her failed relationships--is peacefully taking care of her demented mother in South Carolina. Ellen's brother, Royce, was a celebrated novelist who, a decade earlier, saw his work adopted by racists and fell under the sway of white supremacy. Ellen thought him dead from a botched FBI raid on his compound. But when his estranged daughter turns up on the news claiming he might be responsible for kidnapping her two mixed-race children, Ellen travels to New Mexico to help her newfound niece. The book chronicles Ellen's search for Royce, her descent into the dark abyss of the simmering race war in the country, and the confrontation that occurs when she learns the truth about her family's past. 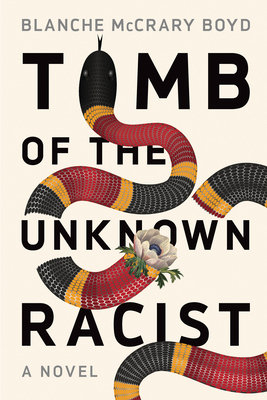 Tomb of the Unknown Racist is a thrilling novel set in the shadow of the Oklahoma City bombing, the subculture of white supremacy, and deep state government. A family drama set against political and racial struggle, it is a tour de force end to a trilogy by a stunning writer whose work has offered a resonant survey of politics and activism across the American experience. BLANCHE McCRARY BOYD has taught at Connecticut College since 1982. She has written four novels--Terminal Velocity, The Revolution of Little Girls, Mourning the Death of Magic, and Nerves--as well as a collection of essays, The Redneck Way of Knowledge. Among the awards Boyd has won are a Guggenheim Fellowship, a National Endowment for the Arts Fiction Fellowship, a Creative Writing Fellowship from the South Carolina Arts Commission, and a Wallace Stegner Fellowship in Creative Writing from Stanford University.